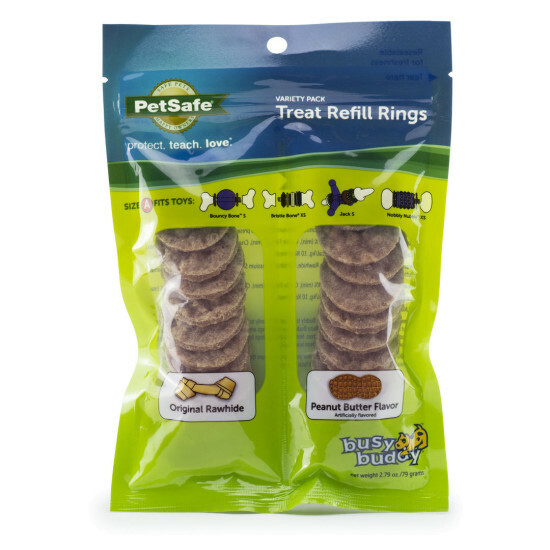 The PetSafe® Busy Buddy® value pack rings combine natural rawhide and peanut butter rings in a resealable bag. The value pack rings are available in sizes A/small, B/medium and C/large. The value pack rings offer variety as well as value. Treat rings are companion treats for the Busy Buddy® Toys - Bristle Bone®, Bouncy Bone™, Jack, Nobbly Nobbly™ and animals (turtle, hedgehog, unicorn and dinosaur).